Boulder, CO, June 29, 2010 /PN/ Photocrati announced the winner of the 2010 Photocrati Fund emerging photographer’s grant last week. 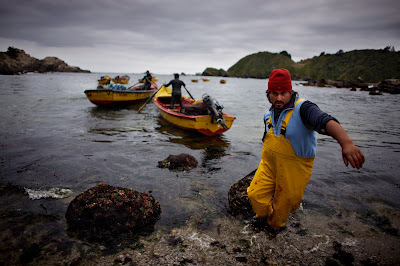 Mark J. Davis, a Seattle-based emerging photographer, will receive a $5,000 grant to pursue his on-going project Fishing For Leftovers, which highlights the impact of commercial over-fishing on small-scale subsistence fishermen in Southern Chile. The Photocrati Fund aims to provide support for talented emerging photographers to undertake important environmental or humanitarian projects that can have a positive impact on the world around them. Davis’ project was selected from a competitive pool of more than 400 applicants by a prestigious panel of judges that included some of the world’s best-known environmental and cultural photographers: Steve McCurry, Michael “Nick” Nichols and Art Wolfe. “I am honored and am extremely grateful that through this grant I will be able to continue to tell this important story,” Davis said. Photocrati Fund finalists include: Bharat Choudary, Anna Beeke, Malin Fezehai, Anna Maria Barry-Jester, Oliver Michael Edwards, Laura El-Tantawy, Andrew Cullen, David Belluz, and Ryan Gauvin. To view images from the winning proposal and to learn more about the top finalists, please visit the Photocrati Blog. “We’re very pleased with this first round of applications, and we’re already looking very forward to next year’s competition,” said Danzer. The 2011 Photocrati Fund competition will begin in November 2010 and will run through March 1, 2011. The winner of the 2011 Photocrati Fund grant competition will be announced at the Look3 Festival in Charlottesville, VA.
Photocrati is a leading photography blog and provider of WordPress themes for photographers. The mission is to foster discussion between photographers working in diverse fields and to share resources that encourage technical, artistic, and professional growth for pros and enthusiasts alike. Photocrati proudly sponsors the Photocrati Fund, a $5,000 grant to photographers working on important environmental and humanitarian projects. This Photocrati Fund looks like a really great photo grant to apply for. always awesome projects funded by photocrati! Congrats to the winner, best wishes. I just had to stop here when your photograph made me say WOW. Love your work. Congrats on the grant.